Network testing and consultancy firm P3 has published a UK mobile benchmarking report ranking EE, aided by its strong data service, first. Three came second, although it won in the voice category. O2 was marginally ahead of last-placed Vodafone. P3 said the testing on the operators’ networks in big cities, towns and connecting routes was conducted by using high-tech measurement equipment, and the process was designed to push the networks to the limit. The report showed all operators have good data service stability in urban areas but each had different strengths and weaknesses. Vodafone and O2 had the best browsing results, while EE apparently scored best in YouTube performance also achieving the highest upload and download speeds. 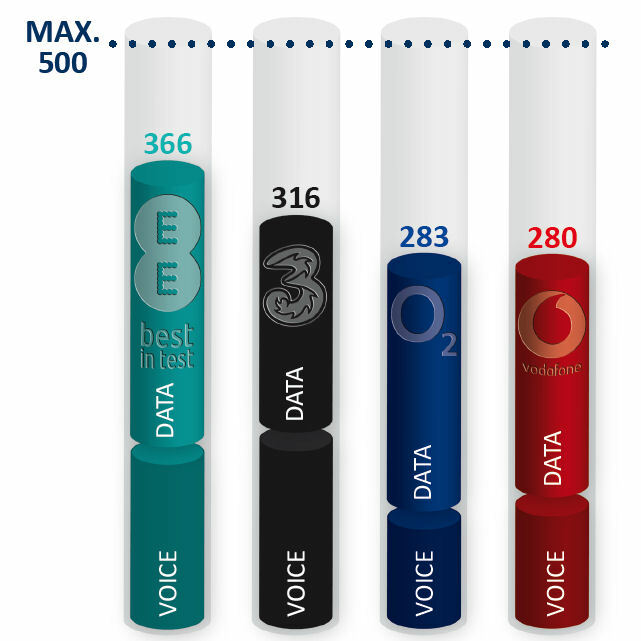 Three scored based in voice, with EE at second place followed by Vodafone and O2. According to P3, the report is designed to provide an independent overview of the current state of mobile network services in the UK, where it is the first time the consultancy has done such a test. The firm has been providing similar network benchmarking in Germany since 2002 and in Switzerland since 2009. It said the test measurement methodology changes each year according to technological advancement. “There have been numerous reports into UK network performance in the last month, each of which shows different results as they are based on different criteria, from locations tested to devices used,” a less jubilant Vodafone spokesperson told Telecoms.com. The report concluded EE’s success in the benchmark was largely attributed to its dominant data performance coupled with a good voice network, but there remains room for improvement for the operator in rural areas. With better data performance, Three could put more pressure on EE. While O2 did well in data, its voice coverage could be significantly improved. Vodafone was actually at third place for both voice and data, but narrowly lost out to O2 on data performance.